Gloria Stuart was an American actress, activist, painter and fine printer. Born Gloria Frances Stewart, she appeared in more than forty films during the 1930s and early 1940s, most of which have been forgotten. Decades later, she was remembered with James Cameron's 1997 blockbuster, Titanic, playing an elderly woman who had survived the ship's sinking. Her mother claimed that her father was descended from the royal Stewarts, but Stuart changed the spelling because she thought that having six letters in both her first and last names would look better when her name was up in lights. She was a flapper in the 1920s. Although sororities were banned at her high school, she and her friends formed one and called themselves the Damma Goto Helltas. She attended just a few semesters of college before marrying. While appearing on stage in Ibsen's The Seagulls, she was seen by two casting executives, one from Universal, one from Paramount. Separately, each asked her to film a screen test the next day, and she wisely said yes to both offers. After her screen tests, they both offered her contracts, and she not-so-wisely signed both. The studios took the matter to court, and an arbitrator ruled that Universal's contract, being signed first, was valid. Stuart is dismissive of most of her early films, saying that Universal was a "B-movie studio" at the time. Stuart was best remembered for her work in horror films, including two of James Whale's -- The Old Dark House and the definitive Invisible Man. She was also featured in the Don Ameche version of The Three Musketeers, and Rebecca of Sunnybrook Farm with Shirley Temple. Stuart was one of the founding members of the Screen Actors Guild in 1933, but retired from films twice, in 1940 to concentrate on stage acting, and again in 1946, when she began selling her paintings, which were featured in several shows in New York and Europe by the early 1960s. Stuart took her first acting job in almost 30 years in the 1975 TV movie The Legend Of Lizzie Borden. She returned to the big screen with 1982's My Favorite Year. In Titanic, Kate Winslet and Stuart played the same character at younger and older ages, marking the first time two actresses were both nominated for Oscars playing the same character in the same film. 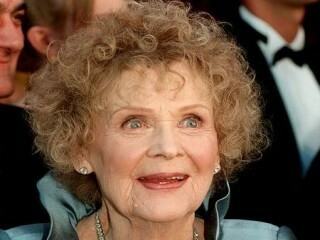 At 90, she was also the oldest Oscar acting nominee ever. When she published her autobiography, I Just Kept Hoping, it angered some readers who wanted her to be the little old lady from Titanic. Stuart instead announced that she was an advocate of free love, and encouraged women to gratify themselves. "I do not need a man. I am devoted to masturbation. I think it's probably one of the most pleasurable experiences in life. I had and have no guilt whatsoever when it comes to pleasuring myself." The book begins with a description of the many animals that lived in and near the ocean when she was a child, species that are now gone. "I belong to every organization there is that has to do with saving the environment," says Stuart. "I am so anti-Mr. Bush and his forestry people and mining people and oil people and gas people that want to take the arctic away from us and drill in the ocean and cut down the forests. I just think it's so wicked. I think it's a sin." Her second husband, Arthur Sheekman, was a newspaper writer who also wrote for Hollywood, with credits ranging from the Marx Brothers' Duck Soup to My Three Sons. Her son-in-law, Gene Thompson, was a TV scriptwriter for My Three Sons, The Flying Nun, and Columbo. View the full website biography of Gloria Stuart.